What problem does this address? What are our safety checks? This post was originally published on Meta Stack Exchange on February 20, 2017. I've republished it here so that I can easily update information related to recent developments. 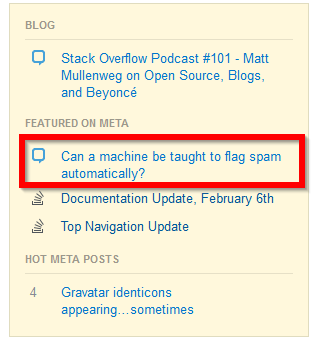 If you have questions or comments, I highly encourage you to visit the question on Meta Stack Exchange and post there. TL;DR: We did it, so... yes. Charcoal is the organization behind the SmokeDetector bot and other nice things. This bot scans new posts across the entire network for spam posts and reports them to various chatrooms where people can act on them. If a post has been created or edited, anywhere on the network, we've probably seen it. The bot utilizes our knowledge of how spammers work and what they have previously posted to come up with common patterns and rules to detect spam in the new and updated posts. You've likely seen the SmokeDetector bot if you visit chatrooms such as Tavern on the Meta, Charcoal HQ, SO Close Vote Reviewers and others across the network. Over time, the bot has become very accurate. Now we are leveraging the years of data and accuracy to automatically cast spam flags. With approximately 58,000 posts to draw from and over 46,000 true positives, we have a vast trove of data to utilize. To put it simply, spam. Stack Exchange is one of the most popular networks of websites on the Internet, and all of it gets spammed at some point. Our statistics show that we see about 100 spam posts per day, on average over the last three months. A decent chunk of this isn't the type you'd want to see at work (or at all). The faster we can get this off the home page, the better for all involved. Unfortunately, it's not unheard of for spam to last several hours, even on the larger sites such as Graphic Design. Over the past three years, efforts with Smokey have significantly cut the time it takes for spam to be deleted. This project is an extension of that, and it's now well within reach to delete spam within seconds of it being posted. For over 3 years, SmokeDetector has reported potential spam across the Stack Exchange network so that users can flag the posts as appropriate. Users have provided feedback to inform the bot on whether the detection was correct or not (referred to as "feedback"). This feedback is stored in our web dashboard, metasmoke (code). Over time, we've used this feedback to evaluate our patterns ("reasons") and improve our accuracy. Several of our reasons are over 99.9% accurate. Early last year, and after getting a baseline accuracy from jmac (thank you! ), we realized we could use the system to automatically cast spam flags. On Stack Overflow the current accuracy of users flagging spam posts is 85.7%. Across the rest of the network users are 95.4% accurate. We determined we can beat those numbers and eliminate spam from Stack Overflow and the rest of the network even faster. Without going into too much detail (if you really want it, it's available on our website), we leverage the accuracy of each existing reason to come up with a weight indicating how certain the system is that a post is spam. If this value exceeds a specific threshold, the system will cast up to three spam flags on the post. We cast multiple flags utilizing a number of different users' accounts and the Stack Exchange API. Via metasmoke, users are given the opportunity to enable their accounts to be used to flag spam (You can too, if you've made it this far). When a post is eligible for flagging because it exceeded the threshold set by each individual user, accounts are randomly selected from the pool of enabled users to cast a single flag each, up to a maximum of three per post so that we never unilaterally nuke something. We give users a choice as to how accurate they want to be with their automatic flags. Before casting any flags, we check that the preferences the user has set result in a spam detection accuracy of over 99.5% over a sample of at least 1000 posts. Remember, the current accuracy of humans is 85.7% on SO and network wide it is 95.4%. We do not unilaterally spam nuke a post, regardless of how sure we are it is spam. This means that a human must be involved to finish off a post, even on the few sites with lower spam thresholds. We’ve designed the system to be tolerant of faults - if there’s a malfunction anywhere in the system, any user with access to SmokeDetector can immediately halt all automatic flagging - this includes all network moderators. If this happens, it needs a system administrator to step in to re-enable flags. We've discussed this with a community manager and have their blessing on the project. We have been casting an average of 60-70 automatic flags per day for over two months, for a total of just over 4000 flags network wide. These flags were cast by 22 different users. In that time, we've had four false positives. We would like to be able to automatically cancel these particular cases. This isn't possible though, so we've created a feature request to retract flags via the API. In the mean time, the flags are either manually retracted by the user or declined by a moderator. The above graph plots the weight of the reasons against its overall volume of reports and accuracy. As minimum weight increases, accuracy (yellow line and rightmost Y-axis) and total reports (blue line) on the left-hand scale increase. The green line represents the number of true positives, which are verified by SmokeDetector user feedback. This shows the number of posts we've automatically flagged per day over the last month. The jump on February 15th, is due to increasing the number of automatic flags from 1 per post to 3 per post. You can see a live version of this graph on metasmoke's autoflagging page. Spam arrives on Stack Exchange in waves. It is easy to see the time of day that many spam reports come in. The hours, above, are UTC time. The busiest spam times of day are the 8 hour block between 4am and Noon. We have affectionately named this "spam hour" in the chat room. Our goal is to delete spam quickly and accurately. The graph shows the time it takes for a reported spam post to be removed from the network. This section has three trend lines that show these averages. The first, red section is when we were simply reporting the posts to chatrooms and all flags had to come from users. You can see we are pretty constant in the time it takes to remove spam during this period. It took, on average, just over five minutes to get a post removed. The green trend line is when we were issuing a single automatic flag. At implementation, we eliminated a full minute from time to deletion and after a month we'd eliminated two full minutes compared to no automatic flags. The last section, the orange, is when we implemented three automatic flags to most sites. This was rolled out last week, but it's already had a dramatic improvement on the time to deletion. We are seeing between 1 and 2 minutes to time to deletion. As mentioned above, spam arrives in waves. The dashed and dotted lines on the graph show the average deletion time during these two different time periods. The dashed lines show deletion time during 4am and Noon UTC, the dotted lines show the rest of the 24 hour period. An interesting thing this graph shows is that time to deletion during spam hour was higher when we didn't cast any automatic flags. It was removed faster outside of spam hour. That reversed when we started issuing a single auto-flag. The spam hour time to deletion is slightly lower than the average. Comparing the two time periods though, time to deletion during non-spam hour at the end of the non-flagging time period and the end of the single flag period are roughly the same. We'll update these in a few weeks too, to better show the trend we are seeing with three automatic flags. We are confident in SmokeDetector and the three years of history it has. We've had many talented developers assist us over the years and many more users have provided feedback to improve our detection rules. Let us know what you want us to elaborate on, features you're wondering about or would like to see added, or things we might have missed in the process or the tooling. Take a look at the feature we'd really like Stack Exchange to consider so that we can further improve this system (and some of the other community built systems). We'll have Charcoal members hanging around and answering your questions. Alternatively, feel free to drop into Charcoal HQ and have a chat.